Home » General Health » E-Cigarettes: Safe or a Killer in Disguise? 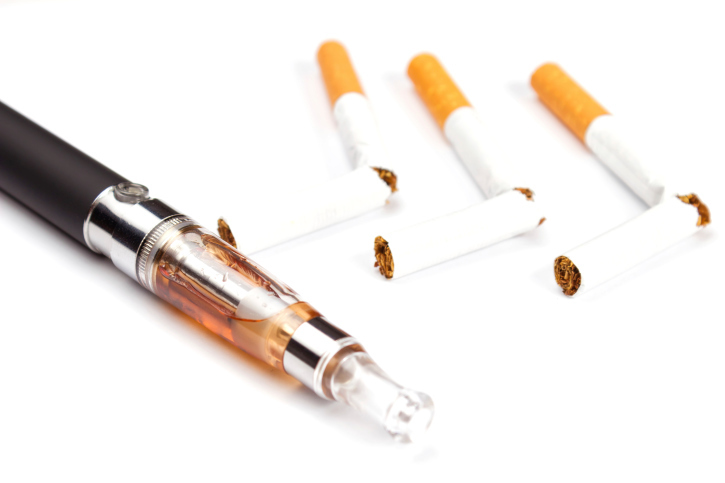 Over the past few years, there’s been a rapid increase in the use of e-cigarettes. I’ve seen people puffing on them at parties and in restaurants, shopping malls, and just about everywhere else. In fact, just the other week, here in the office, we were discussing whether or not they should be permitted in the workplace. These products are marketed as safe alternatives to tobacco cigarettes, and the health risks that come along with smoking are well advertised. The World Health Organization (WHO) reports that half of tobacco smokers will die as a result of their tobacco use; in fact, tobacco claims the lives of six million people every year. This is why e-cigarettes were developed—to offer a safe alternative to wean people off tobacco, thus lowering their risk of lung cancer, emphysema, stroke, heart disease, and the countless other conditions that can develop as a result of smoking. But the jury is still out on their effectiveness in getting people to quit and concerns about emissions from e-cigarettes raise questions about whether or not they are as safe as their marketing would have you believe. Walk into any store across the country, and you’ll see marketing materials about the safety and effectiveness of e-cigarettes. They are touted to produce little more than harmless water vapors upon exhale. However, preliminary studies are showing this isn’t the case and that the second-hand “smoke” from e-cigarettes can be problematic for non-smokers. It’s true that unlike tobacco cigarettes, e-cigarettes do not burn down and smolder, which causes sidestream smoke. However, when users exhale, they blow out a toxic aerosol vapor containing formaldehyde, acetaldehyde, acetic acid, and other toxins. Yes, these toxins are all emitted at lower levels than tobacco cigarettes, but they still impact non-smokers who are in close proximity. For example, one study created the atmosphere of a “smoky” bar where non-smokers were placed in close proximity to people smoking e-cigarettes, then again with people smoking tobacco. The markers of nicotine exposure between both groups of second-hand smokers were evident in both at very similar levels. Furthermore, short-term exposure studies to e-cigarettes have shown a negative impact on lung function in bystanders as a result of exposure to the aerosol emitted from e-cigarettes. So if you’re smoking e-cigarettes inside thinking it’s not harming the people around you, think again. In terms of their ability to help with quitting, there is little evidence to show how effective e-cigarettes actually are. A major review indicates that so far, the data suggests that a number of users continue to smoke and use e-cigarettes at the same time, and that e-cigarette users are a third less likely to quit smoking than non-users. That being said, there is new research saying that e-cigarettes are more effective than other forms of smoking cessation products, suggesting 20% of smokers who switch to e-cigarettes are successful in quitting, compared to the 10% who use other methods like the patch or nicotine gum to successfully quit and the 15% who are successful using willpower alone. As a non-smoker, I think it’s important for marketers to do a better job explaining their products. Based on evidence, e-cigarettes are unsafe for non-smokers and they do emit toxins into the air. Smokers need to know this information so they can smoke responsibly, outdoors and away from those not wanting to be exposed to the vapor. I also think that any product that can get people off of cigarettes is worth exploring; even if e-cigarettes aren’t perfect, the lower levels of toxins make them far “healthier” for a person than tobacco smoke. “E-cigarettes boost quitting success among smokers, study finds,” Thomson Reuters web site, May 20, 2014; http://www.reuters.com/article/2014/05/20/us-health-ecigarettes-idUSKBN0E00UW20140520. Grana, R., et al., “E-Cigarettes: A Scientific Review,” Circulation 2014; 129(19): 1972, doi: 10.1161/%u200BCIRCULATIONAHA.114.007667.